PLAINFIELD TWP. (WZZM) -- Kent County deputies have arrested a 24-year-old man they say robbed a woman with a BB gun at a Meijer store. It happened around 7 o'clock Thursday night on Plainfield Avenue. Deputies say the man approached a woman in a bathroom and told her to give him her wallet. The BB gun looked like a real gun, so she handed it over. With the help of witnesses, deputies eventually tracked the man to a nearby apartment complex where he was arrested. Many of the victim's belongings were recovered. 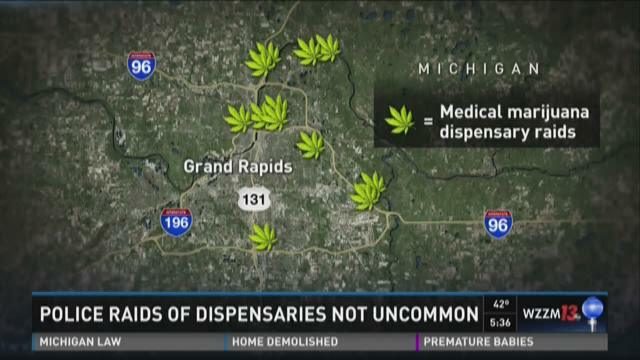 PLAINFIELD TOWNSHIP, Mich. (WZZM) -- There are new details about Wednesday's raid of three medical marijuana dispensaries in Kent County. The Kent County Undersheriff tells WZZM 13 that state and county narcotics teams conducted several undercover operations and then seized marijuana and cash from the businesses in Plainfield Township. PLAINFIELD TOWNSHIP, Mich. (WZZM) -- The man who confessed to robbing two massage business employees last week has been charged with multiple counts of armed robbery. The robbery occurred around 9 p.m. Thursday, Oct. 15, at Panacea Massage on West River Drive. Police say two workers were leaving the business a man pulled a gun on them and demanded money. Deputies searched the area and caught an individual nearby, who confessed to the hold-up. PLAINFIELD TOWNSHIP, Mich. (WZZM) -- Kent County deputies say they have the man who robbed workers at a Plainfield Township massage business. It happened around 9 p.m. Thursday outside Panacea Massage on West River Drive, just east of U.S. 131. Two workers were leaving the business when a man pulled a gun on them and demanded their money. Deputies searching the area after the robbery caught someone nearby, and they say he confessed to the hold-up. The name of the suspect is not being released until his initial court appearance. GRAND RAPIDS, Mich. (WZZM) -- Northview Public Schools and the community are mourning the loss of teacher Kim Slot. Slot passed away Wednesday. She was also the widow of fallen police officer Trevor Slot. PLAINFIELD TOWNSHIP, Mich. (WZZM) -- Kent County now has a new arena where sheriff deputies can train on horses. County leaders cut the ribbon Tuesday on the 20,000-square-foot indoor equestrian training center in the 4600 block of Kroes St. NE. The arena is also being used by local 4-H groups, as well as local school riding teams. The center will provide a place for training the sheriff department's mounted unit, even during the winter months. "Horses need to be trained constantly," said Sheriff Larry Stelma. "Weekly, they have to be exercised, they have to be ridden -- or they soon forget what they're supposed to be doing. The riders need to practice continually to remain proficient. So, they need to train 12 months out of the year. This facility allows them to do that." GRAND RAPIDS, Mich. (WZZM) -- Nearly 700 athletes started to compete in Michigan's fourth annual Titanium Triathlon Sunday in Plainfield Township. Unfortunately for most of them, they never got to finish. The event was called off after several lightning strikes in the area. Race co-director Ann Vidro tells us only the Olympic distance athletes were able to finish. The Olympic distance is a 1.5k swim, 40k bike and 10k run. Vidro says it was especially hard to call the race with so many special stories competing this year. Among the race competitors was Kalamazoo native Scott Lacey, 31. Lacey is legally blind. He would have been accompanied by guides during the 2.4 mile swim and marathon, and ride tandem for the 112 mile stretch along Northland Drive. "It has become more of a challenge against myself," Lacey said.